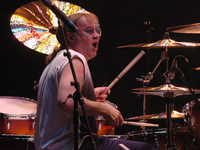 Although not as renowned as Ginger Baker or John Bonham, Deep Purple‘s Ian Paice was one of hard rock/heavy metal’s early standout drummers, and like the other two, influenced countless other skinsmen in the process. Born on June 29, 1948 in Nottingham, England, Paice started off playing violin, before switching to drums at the age of 15. From the mid to late ’60s, Paice played in a variety of obscure local bands, including such names as Georgie & the Rave Ons, the Shindigs, the MI 5, the Maze, Soul Brothers, and Boz, as well as future guitar hero Albert Lee.